The 2018 New Jersey Provincial Directory! While Catholics represent 25 percent of the population in the United States, they represent more than 41 percent of New Jersey’s population, the third largest percentage of Catholics in the nation. The six New Jersey Catholic dioceses—Newark, Trenton, Camden, Metuchen, Paterson and Passaic—serve more than 3.5 million Catholics in nearly 600 parishes in New Jersey. The 500 Catholic elementary and high schools educate more than 120,000 students every year. The 13 Catholic hospitals and numerous health care facilities in these dioceses serve thousands of New Jersey residents. Where can you find reliable, up-to-date directory listings for all these Catholic institutions, facilities, organizations and programs? 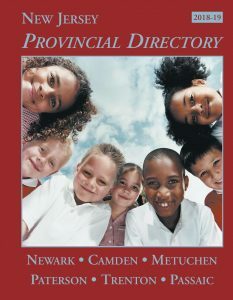 It’s easy with the New Jersey Provincial Directory, the only publication with directory listings for all six of the Catholic dioceses of New Jersey. Now in its 76th year, the 2018 New Jersey Provincial Directory, which will be published in September 2018, is the place businesses, educators, clergy, religious, church professionals and Catholic parishioners turn to for the most up-to-date and comprehensive listings for these dioceses.